It’s Thursday, and you know what that means… it’s time for another #AppyHolidays post! For my second post I present…Stuffed Olives. I know what your’re thinking- yes I did post a Stuffed Mushrooms recipe last week, and this week I am stuffing olives- but truly anything that is stuffed tastes delicious. This recipe is made exclusively by my grandma and I cannot imagine Christmas without them. We always eat these as one of our many appetizers before our big Christmas dinner. Appetizers in the Lynn household on Christmas Day normally consist of: stuffed olives, smoked salmon with dill, a cheese board, and garden salad (the salad is there to keep the food pregame a bit healthy). Now, you can stuff olives with just about anything- pimentos, garlic, blue cheese, mozzarella etc.- and they can even be fried too. But these stuffed olives don’t play around. These olives are stuffed with a simple and straightforward mixture of garlic, parsley, breadcrumbs and olive oil and are served straight out of the fridge or at room temperature. As a bonus, these can be made up to two days in advance so you aren’t scrambling around the day of the party to get these done. Plus, they get better the longer they sit! While these would make a great appetizer on Christmas, these stuffed olives are fantastic as part of a cheese or charcuterie board or served as an appetizer at a cocktail party. 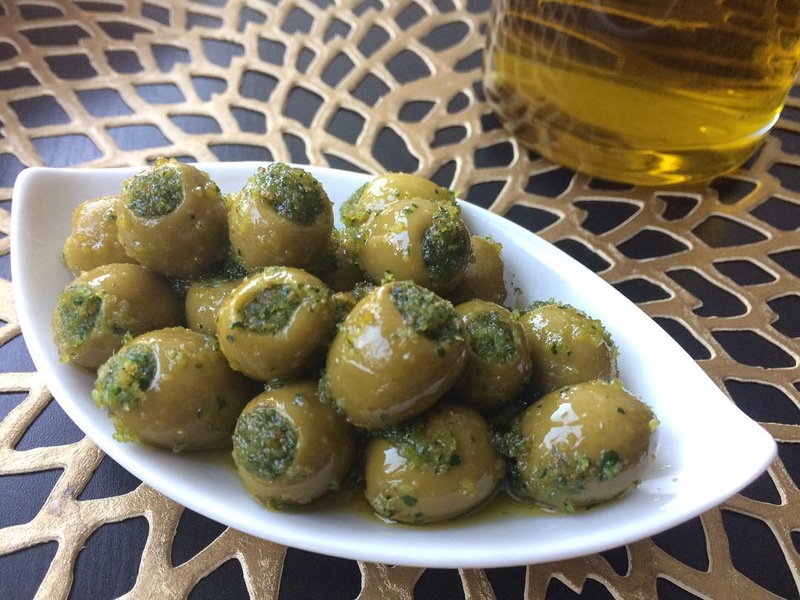 No matter what the occasion, these stuffed olives are always a big hit!